Actors are members of the Harlequin Theater Guild of De La Salle University (Manila). 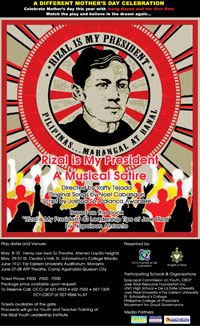 This play was based on the book, "Rizal is My President: 40 Leadership Tips of Jose Rizal" by Napoleon Almonte. I watched this play on May 9, 2009 at Ateneo de Manila University. The play opens us to a world (heaven) where Filipino heroes would interact and plan something for the Philippines, and having that access to have a second life on earth. Other hero characters want Jose Rizal to run as the next President to save the country from turmoil, inadequacy, corruption and hardships. Package price available upon request. Tickets are also available at the theater entrance. Proceeds will go to Youth and Teacher Training of the Rizal Youth Leadership Institute.